When we viewed the house, other people were coming out of it and the look on their faces was screaming, ‘run’,” laughs Jacqueline Mercer, as she recalls seeing her home for the first time. Other, less faint of heart folks would have run a mile, but to Jacqueline, because the house was in such a bad state, it represented an opportunity. “I knew it had to be taken back to basics,” she says. A late Victorian, early Edwardian end-of-terrace, it has three bedrooms and is located in the London suburb of Tottenham. LIVING AREA The light hanging from the central fitting is the classic Volières Bird Cage chandelier, the orange sofa was a Habitat purchase while the grey couch came from Heal’s. 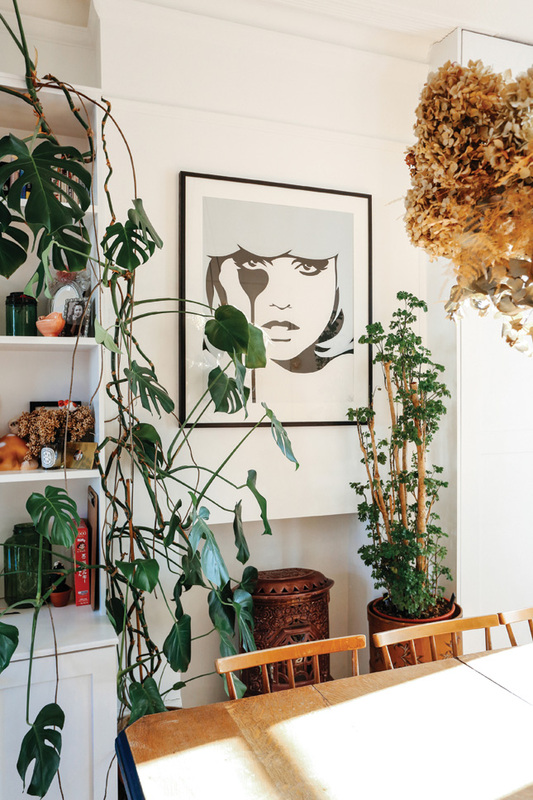 On the wall, Jacqueline has embellished her Tala wall light with a stuffed bird – “I added it on at Christmas and never took it down” – and her love of print shines through in the Orla Kiely cushions and the ‘60s table lamp, from Les Couilles Du Chien in Notting Hill. “They have incredible things,” she reveals. 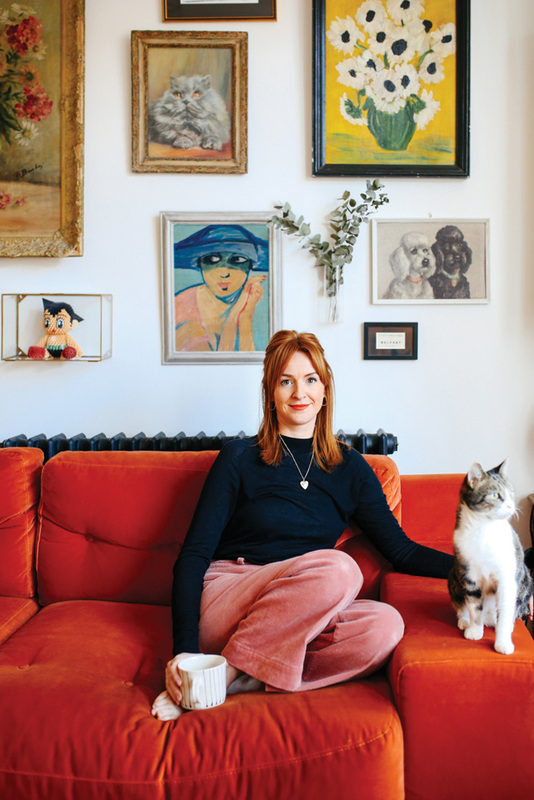 Along with husband Joe (and Tiny the cat), Jacqueline turned that creative eye towards the extensive renovation needed on the house. The blank canvas that was so appealing initially meant that everything needed to be done: new windows, heating, kitchen, bathroom, plastering and the roof were just some of the tasks undertaken to get the house up to scratch. All-in, they spent around €135,000 and carved the budget up carefully. “I always wanted my kitchen, it was my splurge,” Jacqueline says. 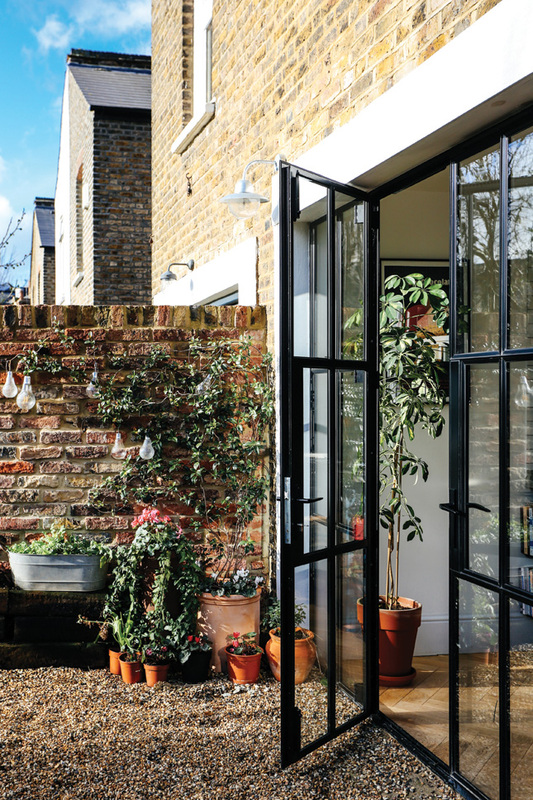 Crittall-alike windows – “that was a cost!” – were used on the back wall and a wooden kitchen installed. 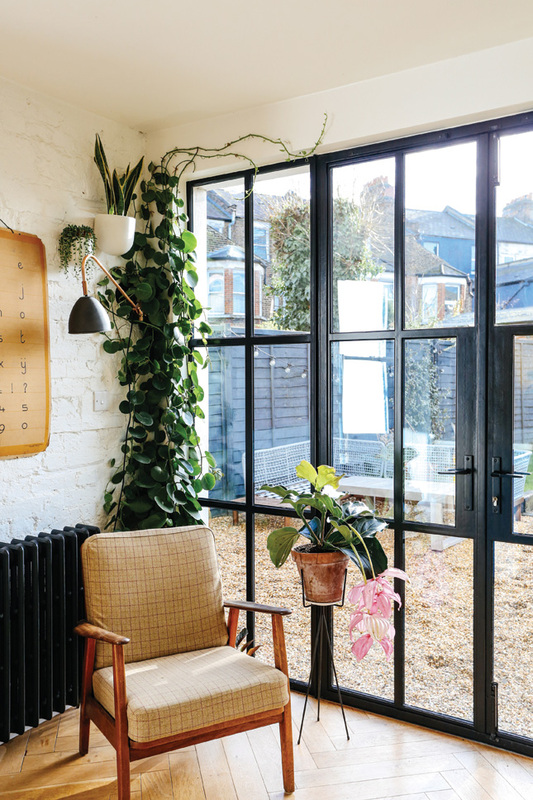 Joe wanted concrete floors here, but the couple settled on worktops in the material instead. “That wasn’t cheap,” she says. 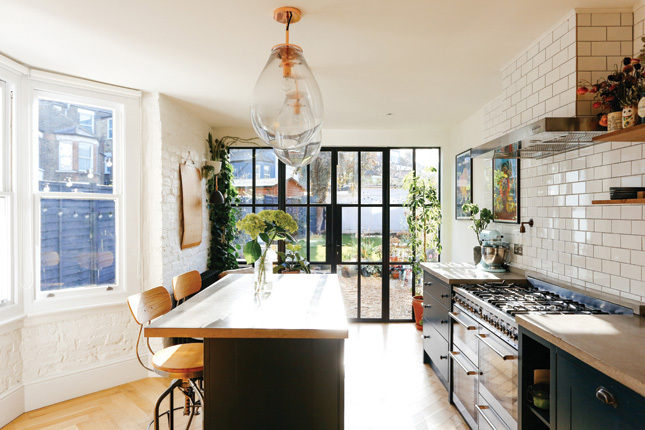 The lighting in the kitchen was also an outlay, costing about €1,350 from Heal’s. They made some smart decisions elsewhere. 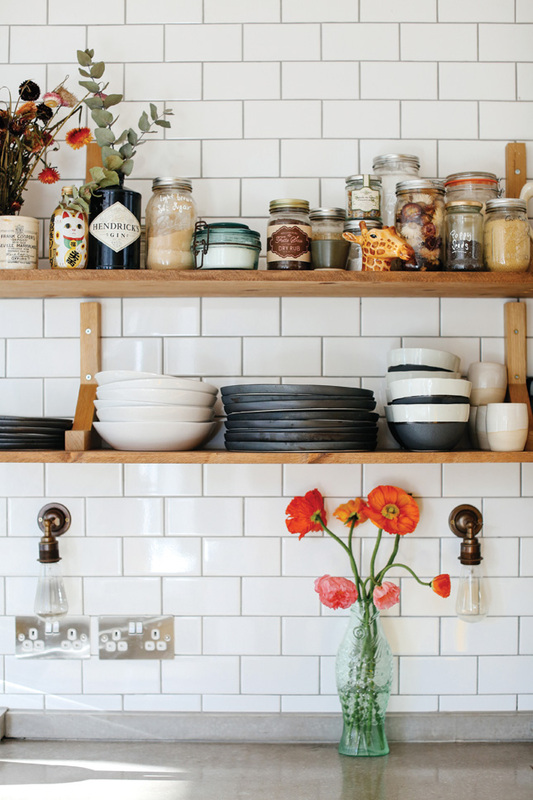 “I was always going to do shelving above the kitchen units as it’s a massive saving to not have cupboards,” Jacqueline reveals. She’s a dedicated fan of a market and the couple got their kitchen table for around €250 at one. 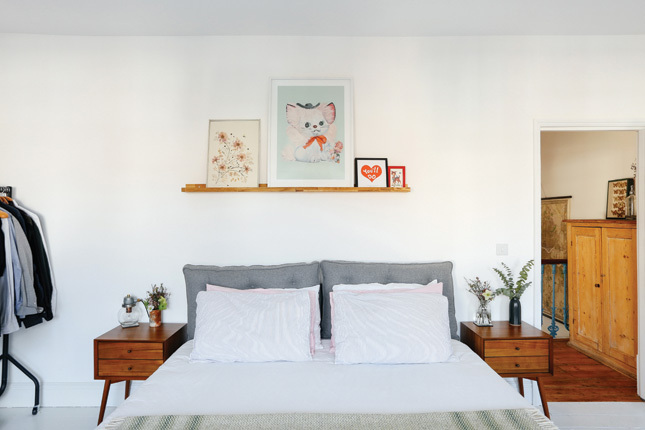 “The chest of drawers in the bedroom was from eBay for around €75 and the sink in the bathroom was about €100 – if you put the right things together it doesn’t have to feel cheap,” she says. LIVING AREA The shelves in the living area were custom made and Jacqueline has filled them with her books, records and objects. “I love collecting silly paintings and vases and jars. I go to the far east a lot and I like to buy something when I travel,” she says. 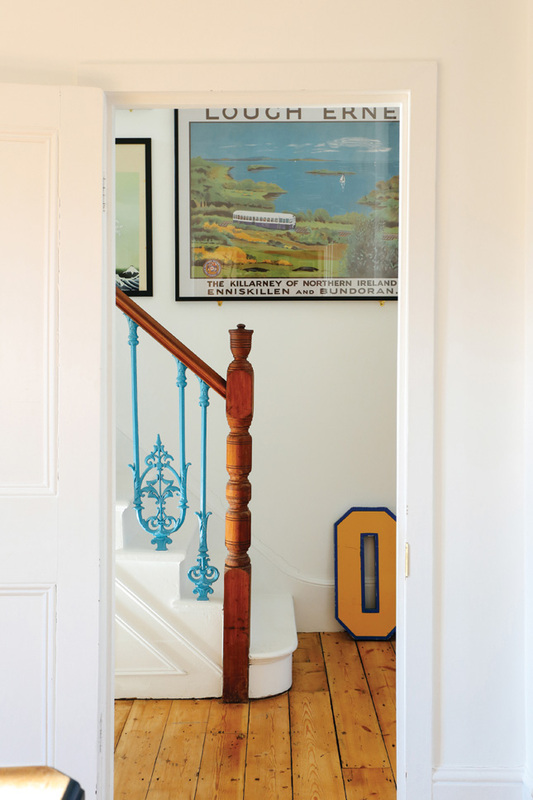 Humour abounds in this home, from the whimsical paintings Jacqueline collects on her gallery wall – “I’m really into oil paintings. I love animal and people portraits. I find them in Portobello market and I they always seem to be a bit fun. 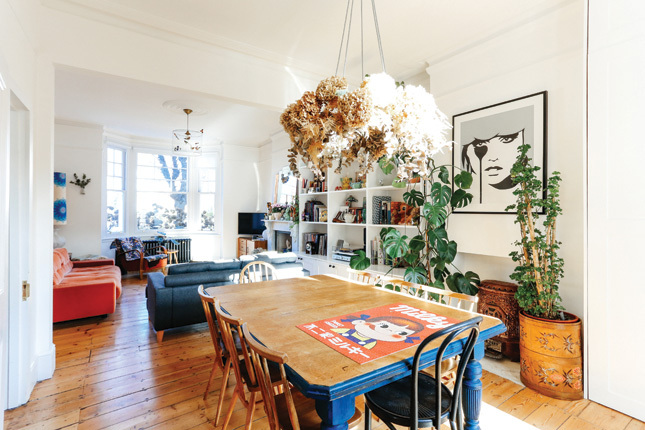 The poodle is one of my favourites” – to the little birds peeking off the tops of lamps and her eye-catching collections of china and wooden dolls. Jacqueline brings home china pigs from business trips to Taiwan, and her love of home is represented in her art collection too. 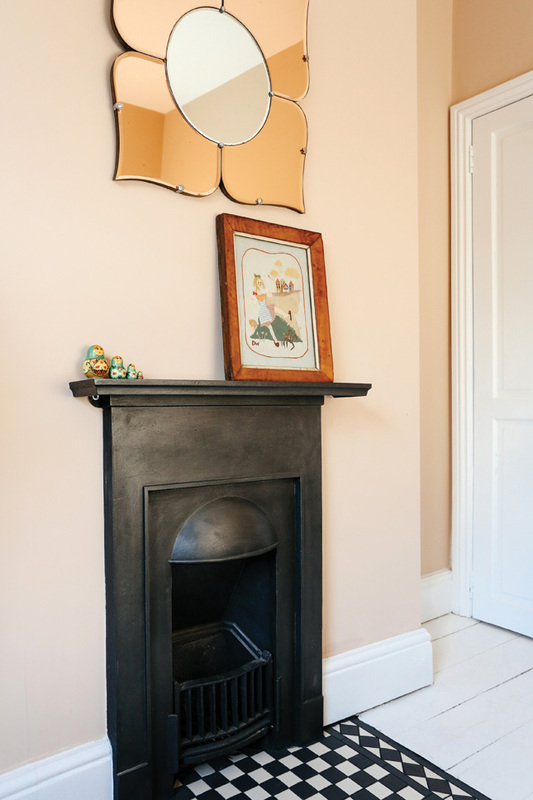 Look closely on the gallery wall and there’s a little ‘Belfast’ there, while in the hall, a print of a Lough Erne railway painting takes pride of place plus there are special pieces of Belleek pottery from family dotted about too. Keep up with Jacqueline’s home journey on her Instagram, @tinyandthehouse, and see more from her house tour below! 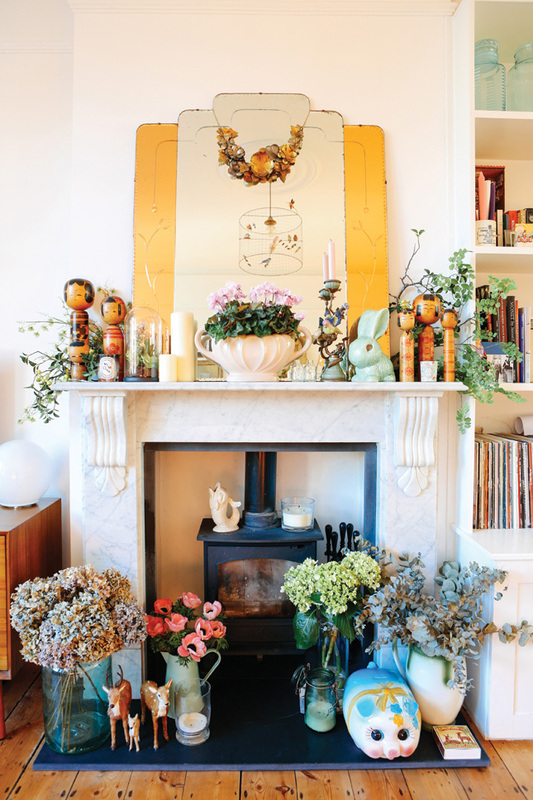 FIREPLACE Jacqueline’s mantra for arranging her collections? “I don’t think you can go wrong really, putting things on a fireplace. Anything looks good.” Her vintage Japanese Kokeshi Dolls, came from Broadway market and Etsy, and she loves to pick up vases and pottery at markets, charity shops and eBay. KITCHEN The solid wood kitchen was a canny buy from British Standard, the off-the-peg brand from the pricier Plain English kitchen company. 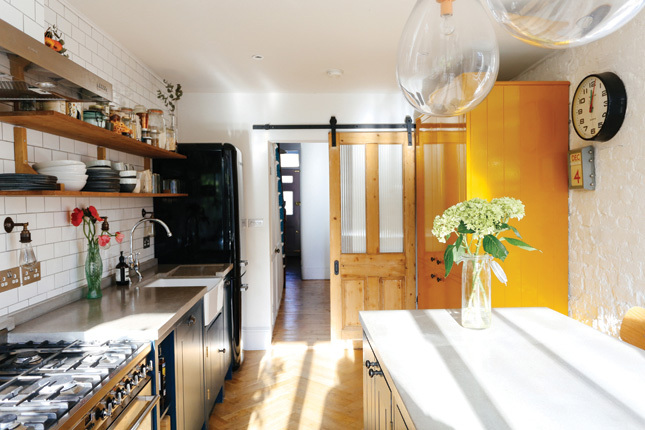 At the end of the kitchen, the glossy mustard-painted unit is also from British Standard and houses the boiler and washing machine. At the island, stools are from Olive and the Fox, as does the wall lighting beneath the open shelving. Jacqueline likes the Broste Copenhagen brand, available at Debenhams for plates and bowls. The glossy mustard painted unit is also from British Standard and houses the boiler and the washing machine. KITCHEN The kitchen is a favoured spot to relax. “I like sitting in the armchair in kitchen. There’s lots of light, the garden is so peaceful and there’s a lovely brick wall too. 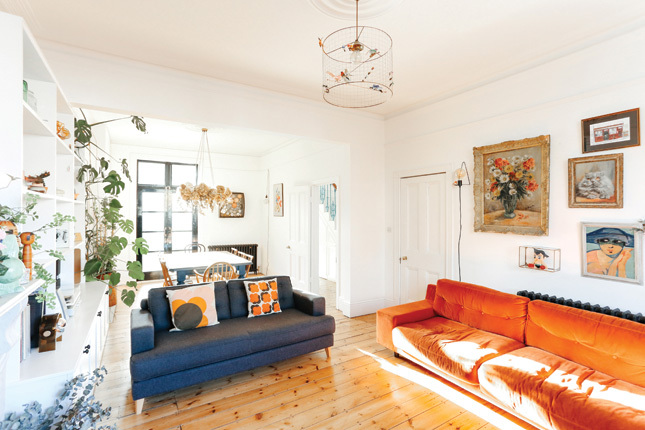 This is a bright house and it’s so good for my mood,” enthuses Jacqueline. 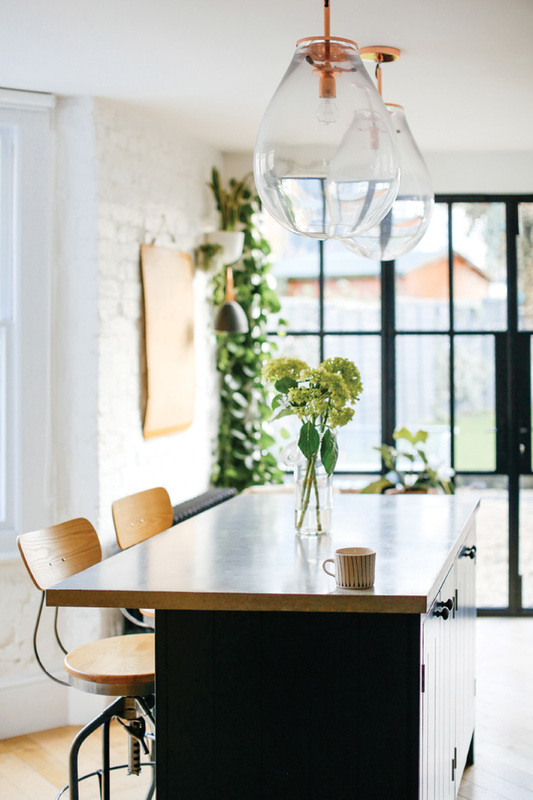 The wall-mounted planters are from West Elm, while the Wall light is from Graham and Green. Find a similar planter at Ferm Living. BEDROOM This large, bright room is full of interesting finds. 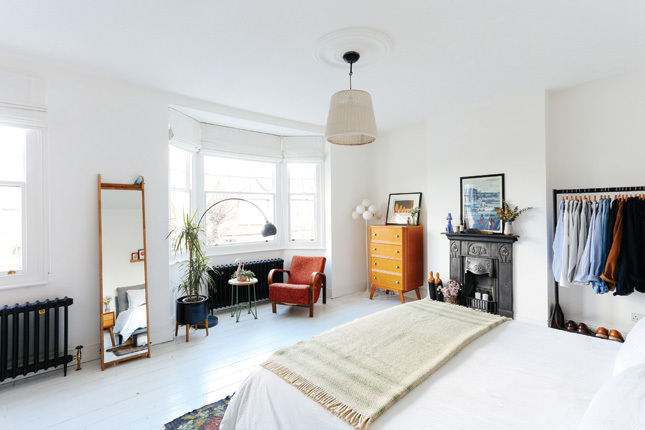 The couple’s upholstered bed is from Heal’s, while the wall mirror was a Futon Company find. The plant pot is a copy of a West Elm design and was a bargain from Homebase. 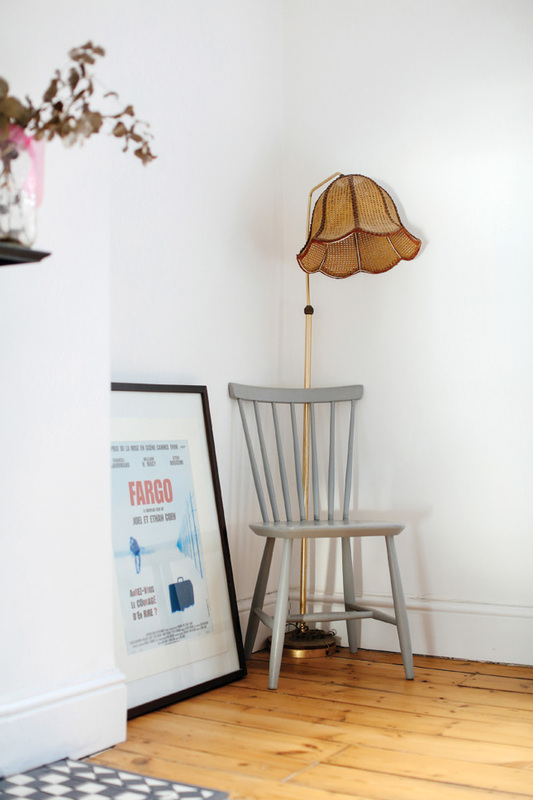 Her white milk glass floor lamp was bought many years ago from a vintage light dealer in London. BATHROOM Cleverly, Jacqueline had her plumber make a unique bathroom unit from a mid-century sideboard, placing a sink on top. 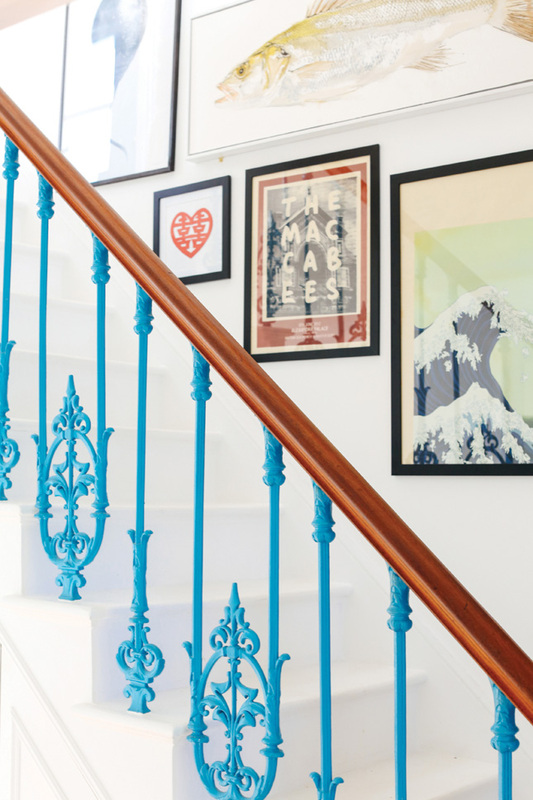 It’s a smart storage solution that looks incredibly stylish. 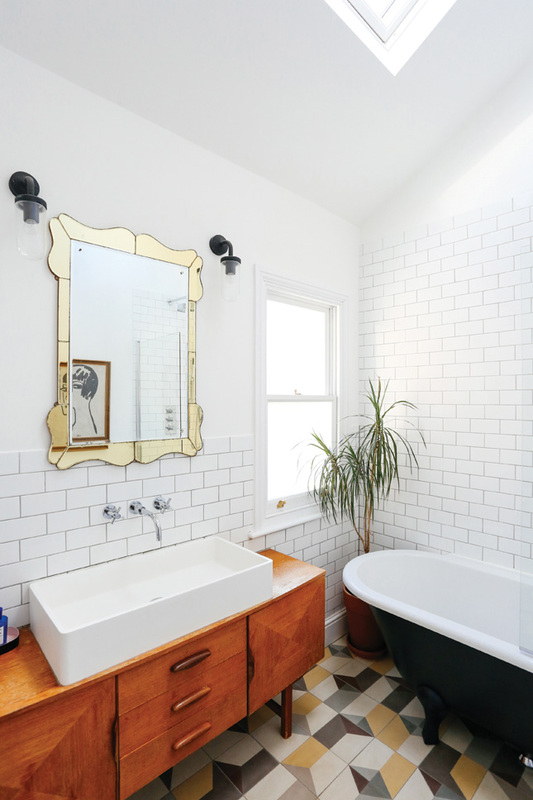 The mirror came from Erno Deco, an antique shop on London’s Portobello Road, and the floor tiles came from Smink Things. “I hate most bathroom lights,” she says, so the couple used outdoor lighting for the wall lights, sourced from Garden Trading.